In 1898, a Russian schoolteacher, Konstantin Tsiolkovsky (1857-1935), proposed the idea of space exploration by rocket. In 1903, Tsiolkovsky published a report entitled Exploration of the Universe with Rocket Propelled Vehicles. In it, he suggested the use of liquid propellants for rockets in order to achieve greater range. Tsiolkovsky stated that the speed and range of a rocket were limited only by the exhaust velocity of escaping gases. For his ideas, careful research, and great vision, Tsiolkovsky has been called the Father of Modern Astronautics. Early in the 20th century, an American, Robert H. Goddard (1882-1945), conducted a variety of practical experiments in rocketry. He was interested in a way of achieving higher altitudes than were possible for lighter-than-air balloons. He published a pamphlet in 1919 entitled A Method of Reaching Extreme Altitudes, a mathematical analysis of what is today called the meteorological sounding rocket. Goddard's earliest experiments were with solid-propellant rockets. In 1915, he began to try various types of solid fuels and to measure the exhaust velocities of the burning gases. While working on solid-propellant rockets, Goddard became convinced that rocket efficiency would be greatly improved by using liquid fuel. No one had ever built a successful liquid-propellant rocket before. Doing so was much more difficult than building solid-propellant rockets. Fuel and oxygen tanks, turbines, and combustion chambers all would be needed. In spite of numerous difficulties, Goddard achieved the first successful flight with a liquid-propellant rocket on March 16, 1926. Fueled by liquid oxygen and gasoline, the rocket flew for only two and a half seconds, climbed 12.5 meters, and landed 56 meters away in a cabbage patch. By today's standards, the flight was unimpressive. But like the first powered airplane flight by the Wright brothers in 1903, Goddard's gasoline rocket was the forerunner of a whole new era in rocket flight. Goddard's experiments in liquid-propellant rockets continued for many years. His rockets became bigger and flew higher. He developed a gyroscope system for flight control and a payload compartment for scientific instruments. Parachute recovery systems were employed to return rockets and instruments safely. Goddard, for his achievements, has been called the Father of Modern Rocketry. In 1923 a third great space pioneer, Hermann Oberth (1894-1989), published a book entitled The Rocket into Interplanetary Space. His book became the handbook for amateur rocketeers. Because of Oberth's work, many small rocket societies sprang up around the world. In Germany, the formation of one such society, the Verein fur Raumschiffahrt (Society for Space Travel), led to the development of the V-2 rocket, which was used against London during World War II. In 1937 Oberth and other German engineers and scientists assembled in Peenemunde on the shores of the Baltic Sea. There the most advanced rocket of its time was built and flown under the direction of Wernher von Braun. For his achievements, Oberth has been called the Father of Space Flight. The V-2 rocket (in Germany called the A-4) was small by comparison to today's rockets. It achieved its great thrust by burning a mixture of liquid oxygen and alcohol and was able to lob a one-ton warhead 50 miles high and hundreds of miles down range. The rocket fuselage was made of thin, collapsible metal that was inflated with the introduction of fuel into the tanks. Once launched, the V-2 was a formidable weapon that could devastate entire city blocks. Fortunately for London and the Allied forces, the V-2 came too late in the War to change its outcome. Nevertheless, by the War's end, German rocket scientists and engineers had already laid plans for advanced missiles capable of spanning the Atlantic Ocean and landing in the United States. These missiles would have had winged upper stages but very small payload capacities. With the fall of Germany, many unused V-2 rockets and components were captured by the Allies. Many German rocket scientists came to the United States, while others went to the Soviet Union. The German scientists who came to the U.S., including Wernher von Braun and Georg von Tiesenhausen, were amazed at the progress Goddard had made. Both the United States and the Soviet Union realized the potential of the rocket as a military weapon and began a variety of experimental programs. The U.S. site chosen by von Braun and his colleagues, was Redstone Arsenal in Huntsville, Alabama, the site at which NASA's Marshall Space Flight Center stands today. The United States first began developing its space program with high-altitude atmospheric sounding rockets, one of Goddard's early ideas. Later, a variety of medium- and long-range intercontinental ballistic missiles were developed. These became the starting point of the U.S. space program. 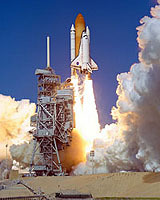 Missiles such as the Redstone, Atlas, and Titan would eventually launch astronauts into space. On October 4, 1957, the world was stunned by the news of the world's first Earth-orbiting artificial satellite launched by the Soviet Union. Called Sputnik I, the satellite was about the size of a basketball, weighed about 183 pounds, and had an orbital period of 98 minutes. It was the first successful entry in a race for space between the two superpower nations. Less than a month later, the Soviets followed with the launch of Sputnik 2 carrying a dog named Laika on board. Laika survived in space for seven days before being put to sleep before the oxygen supply ran out. 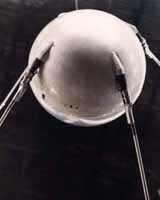 A few months after the first Sputnik, the United States followed the Soviet Union with a satellite of its own. Explorer I was launched by the U.S. Army on January 31, 1958. In October of that year, the United States formally organized its space program by creating the National Aeronautics and Space Administration (NASA). NASA is a civilian agency with the goal of peaceful exploration of space for the benefit of all humankind. The Soviet Union led the Space Race in the early days. But the U.S. persisted and gradually captured the lead, culminating with its Apollo Program to the Moon, which captured the imagination of the entire world. Who can forget John F. Kennedy's daring pronouncement, "We will go to the Moon during this decade...not because it is easy but because it is hard..." or Neil Armstrong's words from the Moon's Tranquility Base, "That's one small step for man, one giant leap for mankind." The Apollo moon rocket is among the largest rockets ever designed to fly into space. Standing as high as a skyscraper, the vehicle literally made the ground shake underfoot when the engines were ignited for liftoff. And they lit the skies as Apollo ascended from Cape Canaveral toward Earth orbit. America continued its flights to the Moon throughout the decade of the 1970's, developing, with each new mission, new confidence and new technology. Perhaps the most spectacular mission of all was Apollo 13, always to be remembered for the outstanding courage and persistence displayed by all involved in what could have been one of America's darkest hours. Rockets have been used to launch many post-Apollo piloted missions, including Skylab, and the many STS missions. Rockets have also launched unpiloted military satellites, communications' satellites, weather satellites, Earth observing satellites, planetary spacecraft, planetary surface rovers, the Hubble Space Telescope, and so on. Since the earliest days of discovery and experimentation, rockets have evolved from simple gunpowder devices into gigantic vehicles capable of traveling into interplanetary space. It might be interesting to hear the thoughts of those earliest rocket pioneers, with their fire arrows and spinning spheres, if they could be brought through time and shown where their discoveries have led. Rockets have certainly opened an important door to the universe.